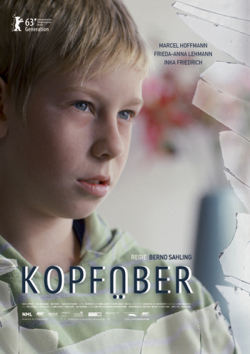 “Kopfüber” is a movie about ADHD. We meet Sascha, a young boy, who just had to change schools because of his unacceptable behavior. He steals, he damages things, he’s always trouble, he screams uncontrollably and he’s unable to read and write. He lives in a family with his mother, bigger brother and sister who all, admittedly, really aren’t much of a help with him. The mother’s always busy and keeps spending time away with her new boyfriend, whom she never introduced to the kids, maybe because he doesn’t want to or maybe because he’s a bit of an escape for her and she doesn’t want these two lives to be mixed. She takes Sascha shopping with her or they watch TV together, but there’s no real connection of spending their spare-time with each other. His older brother has his own troubles and breaks promises with Sascha to take more money from him. His sister actually buys the stuff he stole and keeps giving him cigarettes. Luckily, Sascha still has a friend from his old school (Elli) and the two spend their time together to record strange noises or just be there for each other. They keep doing some stupid stuff as well, but none of it is so severe that it’s the reason for Sascha’s struggles. It’s just what children that age do and perfectly normal. These more severe actions mostly happen when he’s alone and doesn’t know what to do with his time.